To create a new email account in Outlook Express, go to the Tools menu, and click Accounts. A window will open, and show all email accounts (and other account types) you may have previously setup in Outlook Express. Click the Add button on the right, and choose Mail from the menu that opens. 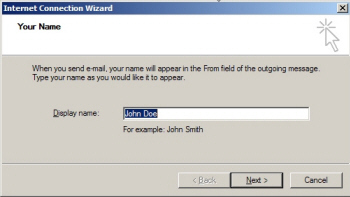 Outlook Express' Internet Connection Wizard will open and ask for a "Display Name" - type your name as you would like it to appear to recipients when you send emails from Outlook Express using your Yahoo! Mail account. After typing your Display Name, click the Next button. In the following screen's text box, type your full Yahoo! Mail email address in the form "userName@yahoo.com" - double-check your email address for typos, and click Next. 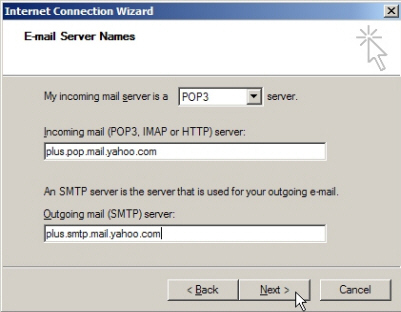 - Type plus.pop.mail.yahoo.com under "Incoming mail (POP3, IMAP or HTTP) server"
Click the Next button to finish setting up your email account. In the final screen of the email account setup, Outlook Express collects your Yahoo! Mail user name and password. Enter again your full Yahoo! email address in the form "userName@yahoo.com" and type your password. 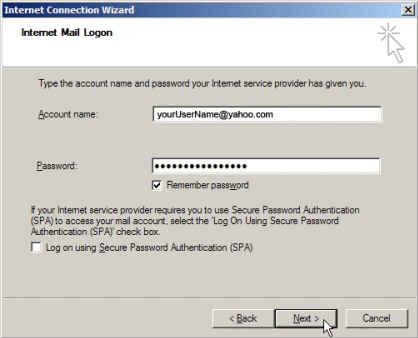 Outlook Express automatically checks the "Remember password" checkbox: this means that you will not have to re-type your password every time you need to check your Yahoo! emails. If you uncheck this box, Outlook Express will ask for your Yahoo! 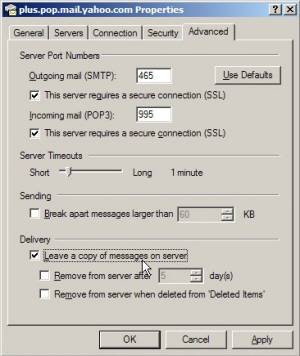 Mail password as needed: this option can be useful if you are using Outlook Express from a computer accessible by other people. We are just about done setting up Yahoo! in Outlook Express: a few more settings remain to be configured manually. Now that you are back in front of Outlook Express' Internet Accounts window, select the Yahoo! Mail account you just created, and click Properties. To make sure your Yahoo! Mail emails are available from anywhere you read them, check the Leave a copy of messages on server checkbox: this instructs Outlook Express to only download a copy of your Yahoo! emails, and leave a copy available on the mail server. This way, the emails downloaded by Outlook Express are still available from any other copy of Outlook Express that connects to this email account, and also available for anyone (yourself included) who logs on to this Yahoo! Mail account from a web browser. You have successfully completed setting up your Yahoo! Mail email account in Outlook Express! Look at your inbox: Outlook Express should have already started downloading your Yahoo! emails. You will now be able to read and respond to your Yahoo! emails both from a web browser, as you did in the past, or directly from Outlook Express, along with any other email account you may already have setup in Outlook Express in the past.